Is it best to blanket your horse? At 27-years-old Mystery the horse found himself looking for a new beginning. His owner was no longer able to provide the care necessary for the aging horse and worked with the Harmony Equine Center’s rehoming program – a program designed to help owners who are looking for a safe place to find a new, loving home for their horse, learn more here. Mystery, like all horses that arrive at our Harmony Equine Center, entered our training program where we determined that, due to his age and his calm temperament, he would best fit into a home that was looking for an easy going, slower paced horse. One who would be ridden casually and with an owner who would understand the additional care he may need due to his older age. This is the part of the story where we meet our adopter Danielle. 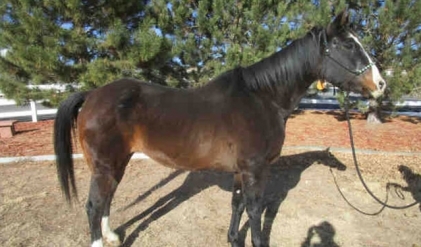 The part of the story where it will soon come as no surprise that it’s no mystery why Danielle rushed to Harmony when she saw this handsome horse appear on the adoption page. But, before we crack the case, let’s learn a little more about Danielle and why she was looking to add another horse to her herd. Danielle, having had horses as a child, wanted to introduce her own children to the rewards and responsibility of horsemanship and contacted the Harmony Equine Center with the characteristics she was hoping to find in a new equine companion. She knew she wanted an older, gentle horse that would be good for her kids to start riding. When Danielle checked out the horses available for adoption on the website, she stumbled across Mystery. Who (are you ready for this?) she was ecstatic to discover was the first horse she had owned as a child at age 13. A lot had changed in the years since Danielle last saw Mystery. He now requires a special mash diet due to worn and missing teeth and his gait is little slower than before. But none of this discouraged Danielle, she just knew this was meant to be. Having ridden Mystery herself as a child, showing him in the American Quarter Horse Association and the Stock Show, she was confident he would be a great first horse for her children, completing a circle in what is the most wonderful coincidence of all time. It’s an adoption story we couldn’t make up, and one that we couldn’t be more pleased to have been a part of. Congratulations to Danielle, her kiddos and of course Mystery for finding each other again. Sometimes things are just meant to be.